As a musician specializing in jazz and hot dance music of the 1920s, and as a relatively recent immigrant to this country (1980), it has always surprised me that so little has been written about 1920s dance bands in Canada. The Bands Canadians Danced To (McNamara and Lomas, Griffin House, Toronto, 1973) provides a limited but nevertheless lively pictorial overview of some of the bands and the ballrooms. Mark Miller's outstanding treatise on the lost history of jazz in Canada, Such Melodious Racket (Mercury Press, Toronto, 1997), and John Gilmore's Swinging In Paradise - The Story of Jazz In Montreal (Véhicule Press, Montreal, 1988), concentrate on those bands and musicians playing improvised jazz rather than music for dancing per se. They Loved To Play - Memories of the Golden Age in Canadian Music (Ginsberg, Venture Press, Toronto, 1998) touches briefly on the early years but its main concentration is on the 1930s and later. Finally, Jazz and Hot Dance in Canada, a 1986 LP issued on the British Harlequin label, is a survey of seventeen outstanding recordings compiled by Toronto jazz discographer, Jack Litchfield, spanning the years 1916 through 1949. There is very little else. Although this might suggest that jazz and dance music were not all that prevalent here, even cursory research disproves this. Canada embraced the new interest in social dancing in the early 1920s as whole-heartedly as other Western countries and made a worthy contribution to the corpus of recordings needed to sustain this craze. This CD focuses on dance bands from the 1920s, the fabled "Jazz Age", and presents a cross section of sides by Canadians playing here and abroad. The music spans the complete spectrum from straight dance music to some peppy sides to some quite hot tracks. Three major events changed the North American entertainment industry in the 1920s: the widespread availability of phonograph records, the imposition of prohibition, and the onset of radio. 1919 was a pivotal year for the recording industry. The first commercial recordings used wax cylinders produced by a vertical or hill and dale recording method. By the early twentieth century, however, the majority of sales were for the more convenient lateral disc records invented by Emile Berliner. The popularity of this format can be attributed to the disc's simplicity, its ease of handling and storage. Up until 1919, two companies jointly held the key patents for the lateral disc recording process - the Victor Talking Machine Company and the Columbia Phonograph Company. If other record companies were to survive and prosper, they would have to break this monopoly. A legal battle ensued in the courts, spearheaded by the Gennett company of Richmond, Indiana. The ultimate result was victory for the small record companies. From 1919 all companies were allowed to produce lateral phonograph discs without fear of being sued by Victor and Columbia. As more recording companies entered the market, musicians had far greater opportunities to record, and the sale of 78s skyrocketed. Coincident with this ruling was a great change in social values after the nightmare of the First World War. Gone was the strict adherence to the Victorian values of hard work and emotional restraint; people were more interested in having a good time and this included dancing. The dance craze had begun around 1910 when reels and dances such as the quadrille, which used relatively complex dance steps, were replaced by one and two steps, tangos and the fox trot, dances which were simple and allowed close physical contact! Two new institutions started up - the cabaret and the dance hall - and these required a steady supply of dance bands. The biggest, albeit unintended, boost to this new culture was the introduction of prohibition in the US in 1920. A large segment of the population saw this as a Government attempt to force people to return to the stricter social values of before the war. Consequently, a large percentage of the urban population began frequenting illegal speakeasies and cabarets. In Chicago, where the city was governed by politicians in league with gangsters, I have seen it quoted that there were over 30,000 speakeasies! The new jazz and dance music flourished in this atmosphere and musicians could earn quite fantastic salaries. Canada introduced prohibition on a provincial basis in 1916, except for Quebec, and all provinces repealed their "temperance acts" in 1926, seven years before the United States. Canadians adhered to their laws much more stringently than their southern neighbours and, although illegal drinking establishments existed, they were far fewer in number and did not offer musical entertainment. Quebec enthusiastically rejected any possibility of prohibition and consequently its bars, cabarets and nightclubs flourished. Hello Montreal!, a popular song recorded by numerous dance bands in 1928, extolled the attractions of that city's wide open nightlife, free of prohibition's constraints. 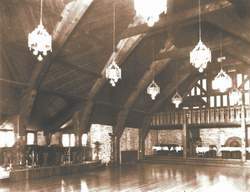 In addition to the small nightspots, huge dance halls sprang up across North America, often located within major hotels. The hotels would usually have "house" bands or orchestras that would play long residencies. The final piece of the jigsaw was the introduction of radio in 1920. Both Canadian and American radio stations regularly played dance records from their earliest days and also broadcast dance music "live", usually from a hotel ballroom. In both instances, this provided excellent exposure for the dance bands. Radio did restrict some opportunities for Canadian bands, because it was easy for Canadian residents to tune into the huge number of American stations rather than the far fewer stations broadcasting in Canada. Naturally American radio stations broadcast American bands. What exactly were Canadian musicians listening to from south of the border? American recordings were issued on Canadian labels but the vast majority were produced by fairly straight white bands consisting, as in Canada, of trained musicians. Very few records by the hotter African-American jazz bands were issued in Canada, in fact fewer than thirty! It is therefore not surprising that Canadian bands elected to play and record what the American white population thought jazz or hot dance music was at that time. Canadian dance bands and musicians are inextricably linked with two countries, the United States and Britain, but for two very different reasons - one proximity, the other political. Canada, being right next door to the United States, was highly influenced by the changes in the social climate of that country. As in the US, dance halls sprang up everywhere in Canada. For example, the Palais Royale, on Toronto's lakeshore, opened in 1922. Canada's well established chains of hotels run by the CNR and CPR railway companies all had resident dance bands. Today, there are official restrictions to American bands playing in Canada and Canadian bands playing in the US, despite the fact that ALL musicians are in the same union - the American Federation of Musicians (A.F.M.) - and that the two countries enjoy free trade. In the 1920s there were no such barriers to bands from either country playing north or south of the border. The result was that some excellent American bands played here, for example, Detroit-based bands such as McKinney's Cotton Pickers, and the Orange Blossoms which later became the Casa Loma Orchestra after playing at that famous Toronto landmark. Some lesser known American bands played long residencies at various hotels in Montreal and even recorded there for Berliner and Compo, for example, the orchestras of Yerkes, Joseph Samuels, Jack Denny and Sleepy Hall. Generally speaking, American bands did not play long residencies in Ontario hotels until well into the 1930s although they did play for short periods in Toronto and other Ontario dance halls. Unlike in Montreal, it appears that long term residencies playing at such prestigious hotels as the King Edward and the Royal York, which would have given the resident bands constant well paid work, were taken by local orchestras. A recurring theme in this story is that Canadian musicians often had to leave Canada to become successful and to make their reputation. Among those who went to the US were Teddy Joyce and the Culley brothers, some of whose recordings you will hear on this CD. One band in particular stands out above all others - Guy Lombardo and his Royal Canadians. This group left Canada in 1924 and became an American institution. From 1928 on, Lombardo's band recorded exclusively for Columbia, one of the two biggest American labels. Sales figures indicate that they were second in Columbia's rostrum of artists alongside Paul Whiteman and Ted Lewis behind its number one selling artists, the comedy team of Moran and Mack. The greatest opportunities for Canadian musicians, however, came about because of Canada's close historical ties to Britain. Up until the Second World War, anyone born in selected countries within the Empire was considered British. At the beginning of the 1920s, British dance bands were certainly not up to date with the latest musical developments that had taken place in North America. They were caught unawares when the new rhythms were embraced by the British public. Consequently, there were considerable opportunities for North American bands and musicians to play in Britain. As is human nature, resident musicians complained that British jobs were being taken by American musicians. The government was eventually persuaded by the Musicians Union, which had become stronger in Britain in the 1920s, to prohibit American musicians from playing there. (I might add that this left the country way behind as far as jazz was concerned and this situation was not to change until the ban was relaxed somewhat in the early 1960s). This gave Canadian musicians, however, a golden opportunity since they were regarded by the British government as having all of the rights of a British citizen. A number of Canadian musicians took up residency in the UK and some spent most of their careers there. 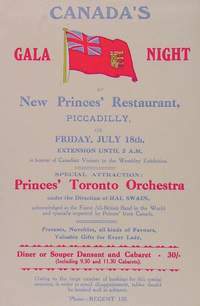 In particular, a group of musicians from Toronto formed a band that played a long residency at the New Princes' Restaurant in London. 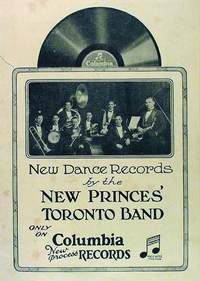 A modified version of this band played in Germany in 1926 as Dave Caplan's Toronto-Band from Canada, and then yet another version of the group continued at the New Princes' Restaurant under bandleader Alfredo's leadership. 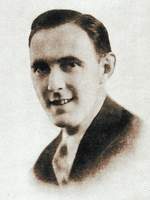 Musicians such as Max Goldberg, Hal Swain, Les Allen, Alfie Noakes, Art Christmas, among others, were mainstays of the British dance band scene up until the onset of war in 1939. It is ironic that one particular Canadian band from St. Catharines, Ontario, led by Billy Bissett (later to be known as Billy Bishop in the US) was so popular in Britain in the 1937-39 period that British musicians were complaining of a "Canadian invasion" in the dance band business and did everything they could to persuade their government to do something about it! Dance bands resident in Canada suffered from a major disadvantage - limited opportunity to record their music, with the loss of publicity that these recordings would have given them. By the early 1920s, there were five main record companies in Canada - the Berliner Gramophone Company (affiliated with the Victor Talking Machine Company of Camden, N.J.) and the Compo Company, both located in Montreal, and the Columbia Phonograph Company, the Brunswick-Balke-Collender Company and the Pathé Frères Phonograph Company in Toronto. As far as I know, Columbia, Brunswick and Pathé did not have recording studios in Canada, which meant that the only recording opportunities that did exist were in Montreal. The few Canadian bands that recorded in Canada in the 1920s were playing almost exclusively in Montreal. This is not surprising as the record company executives would only be exposed to local bands and would not be inclined to bring in musicians from outside. It will become apparent, however, as you listen to this CD that the best musicians and bands were in fact playing in Toronto and Southern Ontario, and it is a shame that they did not have greater opportunity to record. In saying this, if the situation was unfavourable for Ontario-based bands, recording possibilities for bands in other parts of the country were non-existent and we can only speculate on how they sounded! Musically, one thing that strikes me is the suggestion of an "Ontario sound" in some of these recordings. The much heralded synchronized saxophone section work of Guy Lombardo's band is very much present in the New Princes' and associated bands of Dave Caplan and to a lesser degree Alfredo. To this experienced listener and jazz afficionado, what strikes one is the very high musicianship of Canadian musicians and their ability to compete in a worldwide context. So, sit back, pour yourself a glass of Canadian Club or uncap a Molson's Ex, and enjoy these Canadian musicians from yesteryear as "music makes the world go round"! Luigi Romanelli (b. Belleville, Ontario, 29 Nov. 1885, d. Murray Bay (La Malbaie), Quebec, 29 July, 1942) was born into an Italian musical family. He was the nephew of Rocco Romanelli, known as "Romanelli the Great", who toured briefly with Enrico Caruso and Nellie Melba. His father, Joseph Romanelli, was a concert and theatre harpist. Luigi's two brothers, Don and Leo, led orchestras at two of Toronto's most prestigious venues, the Royal York Hotel's Imperial Room and the Old Mill Restaurant dance hall respectively. Luigi worked with a vaudeville troupe in 1904 before touring Canada as a violin soloist from 1906 to 1912. 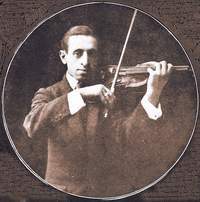 Around 1910 he studied violin with Jan Hambourg in Toronto and then worked in various local theatre orchestras. In 1918 he became music director of the Allen Theatre chain and led one of the first orchestras to accompany silent movies. His orchestra at Shea's Theatre was the first in Canada to broadcast live on radio, for CFCA in 1922. Thereafter, he regularly broadcast for the CRBC, CBC and occasionally for NBC's "Blue" network. In 1923 he became music director for United Hotels in Canada, a position he held until his death. He is associated primarily with the King Edward Hotel in Toronto where he performed for over twenty years in its Oak Room. It is therefore surprising that Romanelli's Orchestra made so few records, just two for Berliner's HMV label in 1922 and supposedly a single record for Edison in 1929. The record that was issued under his name on the short-lived and consequently extremely rare, "thin" lateral-cut Edison label was in fact made by another band. It is unclear why this substitution occurred. Possibly there had been technical problems and the Edison company was unwilling to recall Romanelli's band down to Orange, New Jersey, to re-record. Pianist Billy Munro (b. Grenada, 1893?, d. Montreal, 16 October 1969) was, by 1922, a mainstay of the Montreal musical scene. His popular composition, When My Baby Smiles At Me, was recorded in 1920 by band leader Ted Lewis, his employer at the time, and it enjoyed some success. Munro's Orchestra was resident at the popular Montreal nightspot, the Jardin de Danse. By early 1923 the band was working under the name of the Melody Kings Dance Orchestra and was led by American banjo player Andy Tipaldi. Sheet music of the day, which often depicted performers associated with a particular song, described the band as "Canada's Premier Dance Orchestra" and "They are to Canada what [Paul] Whiteman is to New York". 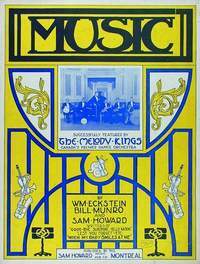 In 1922 Munro co-wrote Music (Makes The World Go Round) with popular Montreal-born pianist Willie Eckstein. The Melody Kings recorded this composition twice, first for Compo in 1922 and then a few months later a far better version for Berliner, which is included on this CD. Munro played piano on this recording in a novelty style reminiscent of Eckstein and such pianists as Zez Confrey in the US and Billy Mayerl with the Savoy Havana Band in Britain. Late in 1923 the band recorded a quite competent version of Limehouse Blues. This was one of the very few tunes written by British composers to become popular from that period. "Limehouse" refers to the rather seedy part of London situated on the Isle of Dogs in the middle of London's infamous East End. The cornetist on this recording is believed to be Johnny Dixon, an American-born musician brought up in Montreal who later moved to New York and then to Germany where he is thought to have recorded several "hot" sides. The Melody Kings were considered the jazziest band in Montreal at that time, and the last ensemble chorus on this track suggests that they were capable of playing in a hotter style. Capt. Merton W. Plunkett, (b. Orillia, Ontario, 1888, d. Toronto, 21 December 1966), was leader and manager of the famous Toronto-based vaudeville troupe, The Dumbells, which had enjoyed much popularity with its comical presentation of songs and sketches during the First World War. By 1922 the Dumbells were presenting their third civilian revue and introduced the Overseas Orchestra into their act. The troupe toured Canada throughout 1922 and 1923. While performing in Montreal it recorded eight sides for Berliner's HMV label, including two instrumental sides, one of which is presented here. Winter Will Come was written for one of the Dumbells revues and consequently doesn't really sound like a dance number. Little is known of this band. I believe Leonard was an American band leader. Rust's American Dance Band Discography lists 28 issued recordings by Harold Leonard and His Red Jackets between 1922 and 1927 on Gennett, Okeh, Brunswick and Columbia. He seems to have led a band at Montreal's Windsor Hotel in 1924 and 1930 when he recorded 20 titles for the Victor Talking Machine Company of Canada, formerly Berliner. The Windsor Hotel is one of downtown Montreal's most prestigious and historic landmarks. Built in 1876 it was considered "the palace of Canada" and boasted two lavish ballrooms, the French Renaissance style Salon Versailles and the Victorian style Salon Windsor. Although converted to office buildings about 20 years ago and renamed Le Windsor, it has retained its two majestic ballrooms. It is likely that some local Montreal-based musicians played on the bandstand with Leonard and are possibly present on the two recordings on this CD, but this cannot be corroborated. Manda was written by the two foremost African-American composers of the day, Eubie Blake and Noble Sissle, and was featured in the successful "Chocolate Dandies" revue in New York City. The violin, presumably played by Leonard himself, is used as the main melody instrument for several choruses. This was quite normal at the time. By the time Everything Happens For The Best was made in 1930, this approach was considered outdated, although Leonard continued to use the same type of arrangement. The muted trombone solo, however, is quite effective and certainly the band has a more modern, fluid sound with the use of string bass rather than tuba. Guy Lombardo (b. London, Ontario, 19 June 1902, d. Houston, Texas, 5 November 1977) was the eldest of three brothers. His two brothers, Carmen (1903-1971) and Lebert (b.1904), together with pianist Freddie Kreitzer, formed a band called the Lombardo Brothers Orchestra which played its first major engagement in 1919 at a dance pavilion at Grand Bend, Ontario. An enlarged group played the 1922/23 winter season at the Winter Garden in London, Ontario, followed by a summer season at Port Stanley. The band cut short its second winter season at the Winter Garden to take up a residency in Cleveland and remained in the US from this time forward. 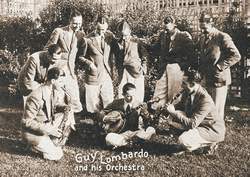 By 1924 the band, now known as Guy Lombardo and his Royal Canadians, began a two-year residency at a well known Cleveland nightclub called the Claremont Tent. In March 1924 they made their first recordings, four sides for the Gennett company in Richmond, Indiana, one of which is included on this CD. This track alone, Cotton Pickers' Ball, shows how superior Lombardo's band was, compared not only to other Canadian bands at that time but also to the very best white American outfits. Lebert Lombardo's wa-wa solo is right up to date for this time and the band swings along very nicely, especially in the final ensemble chorus. These Gennett records were also issued in Canada on Compo's Starr-Gennett label and are extremely rare today. They pre-date the famous smooth saxophone Lombardo sound which was developed during the band's stay in Cleveland. In 1927, a roving music correspondent for Variety reviewed the band's show at Cleveland's Blossom Heath Inn: "The band attraction is Guy Lombardo's Royal Canadians, so named because of their Canuck derivation, and [it is] shaping up as a musical find that should inspire a rave in these dog days of dreary dansapators and so-so entertainment. Under Lombardo's direction, this combination of 10 socks out dance music that would make the jaded New Yorkers, for instance, sit up with startled alacrity. Only every so often does a dance unit come along that possesses a gifted knack of presenting smooth syncopations of inspirational proportions. A tonic for sluggish feet, the double quintet delivers a brand of dansapation that places them head and shoulders over a general run of standard units." The band moved to Chicago in 1927 to play at the Granada Cafe where it broadcast regularly on WBBM. In 1929 Guy Lombardo and His Royal Canadians began a 33 year residency at the Roosevelt Grill in New York City. Its New Years Eve performance in New York became an American tradition and was broadcast each year on radio and later on television. Although Guy Lombardo's orchestra was considered one of the finest dance orchestras in the world, in the early years it was also quite capable of playing hot music. Its rendition of Nobody's Sweetheart, recorded for Vocalion under the pseudonym "Louisiana Rhythm Kings", is quite outstanding. The hot clarinet work is only bettered by Lebert's trumpet playing which really drives the band whenever he "opens up". After a performance such as this it is amazing to think that this band could also play "the sweetest music this side of heaven" as it was described by the press at that time. Believe it or not, none other than Louis Armstrong always stated that Lombardo was his favourite band. On a lot of Armstrong's recordings from the 1930-31 period you can hear his band using that famous, smooth saxophone section style. Closely intertwined, these three bands might almost be considered the same band. Ultimately, two musicians are the beginning of the story, Les Allen and Hal Swain. Both were born in England, although Les Allen (1902-1996) was brought up in Toronto after his parents emigrated to Canada when he was an infant. Hal Swain (1894-1966) was eight years older than Les Allen and moved to Toronto in 1921 where he quickly formed his own band. By 1924 both musicians were playing in the saxophone section of Swain's band when Sam Lashiver, the entertainment agent for Rector's Club in London, England, auditioned the band for a possible engagement at the club. Although unimpressed he did recognize the abilities of both Allen and Swain and invited them to form a new outfit to play at the club later that year. Rector's Club in Tottenham Court Road had been the venue for the most important jazz/hot dance bands that visited Britain. 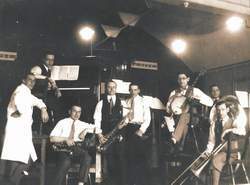 These included, in 1919, the Original Dixieland Jazz Band, the first jazz band ever to make recordings, and Bennie Peyton's Jazz Kings the following year. This latter group included the world's greatest jazz clarinetist/saxophonist at that time - Sidney Bechet. Allen and Swain recruited banjoist Dave Caplan and trumpeter Alfie Noakes from Romanelli's Orchestra at the King Edward Hotel. They also invited Toronto musicians Billy Hall on trombone, Frank Walsh on piano, and Randall Garrison on string bass and tuba. The band rehearsed en route aboard ship, but before its arrival in London the members heard that Rector's Club had closed. Fortunately their agent, Sam Lashiver, secured an audition to play at the New Princes' Restaurant in Piccadilly. They passed the audition successfully and became one of two resident bands that would play at the restaurant without a break for the next two years. The other band was led by an American violinist, Alfred Gill, who is better known as Alfredo. Hal Swain fronted the new group, now known as the New Princes' Toronto Band, although he was actually co-leader alongside Les Allen. Over the next two years they recorded 54 issued titles for the English Columbia label. Three of these sides are included on this CD. 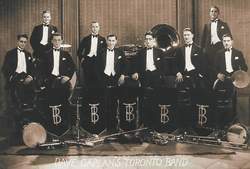 At the time the New Princes' Toronto Band arrived in London, the best bands in the city were probably the Savoy Havana Band and the Savoy Orpheans. The New Princes' recordings show that it was every bit as good as these resident bands. That's Georgia is a good example of the synchronized saxophone style used by Lombardo around this time. Swain's vocals suffer from the same "stiff" approach as other British-born vocalists of that time and it is a shame that Les Allen's far superior vocal talents were not used more often on the band's early recordings. I Love My Baby is an excellent example of the use of the Charleston rhythm current in 1926 as well as a fine vocal from Allen. Swain left under acrimonious circumstances in February 1926 and was replaced by another Torontonian, Harry Hoffman. Soon thereafter, Dave Caplan obtained a booking for the band to play in Berlin. Most of the members were not keen on taking the engagement and left the band. In August 1926 only Caplan and Allen from the original band travelled to Germany. The band was augmented by another well known Toronto-born saxophonist, Art Christmas. Also included was drummer Lorne Cole, a member of Orville Johnston's Band from Ottawa, Ontario. This unit had recently finished playing an engagement in Britain under the name Paul Specht's Canadian Band. Paul Specht, a well known American band leader, had been hired in 1925 to supply an orchestra to open the Kit Kat Club in London, but recent changes in the British government's employment policy would not allow non-British bands to play in the country. As mentioned previously, Canadians at that time were still considered British citizens and were therefore allowed to play in the UK. Specht invited Orville Johnston to accept the engagement and at the club the Ottawa band played under Specht's name. While in Berlin, Caplan's Band recorded 56 sides for Deutsche Grammophon / Polydor. All of these records are extremely rare today and in fact some are not known to exist. Not surprisingly, Caplan's band has an approach similar to the New Princes' band with the use of Charleston rhythms and the aforementioned synchronized saxophone style. You Should Worry Over Me includes an excellent example of Les Allen's beautiful diction, something which he still had when I was fortunate to meet him, just a few months before he passed away in 1996. The band returned to Britain in January 1927 and the core members, Art Lousley, Jack Collins, Laurie Day and Dave Caplan, returned to the New Princes' restaurant under the leadership of Hal Swain. Les Allen elected to join Alfredo's Band, still the other resident band at the New Princes' Restaurant. Alfredo had already secured the services of several of the original New Princes' Toronto Band members who hadn't travelled to Berlin, namely Frank Walsh, Randall Garrison and Alfie Noakes, all of whom were Canadian. Alfredo's band made many records in the 1925-30 period, all for the Edison Bell Company. Many were issued on the Edison Bell Radio label. This was an eight-inch record with a smaller than usual paper label so that the playing time equalled that of a normal ten-inch record. The four sides included on this CD are true hot dance music of songs written by the cream of American composers of that period. By this time Alfie Noakes was fast developing into a very good trumpeter as you can hear on these tracks, in particular on On The Sunny Side Of The Street. By 1932 he was a member of Lew Stone's outstanding band at the Monseigneur Restaurant in London's West End, considered by many to be Britain's finest hot dance band ever. Teddy Joyce (real name Edmund John Cuthbertson) was born in Toronto in 1907 of Scottish parents. He studied music in Toronto and Detroit and made his career in the US before moving to London, England, in 1934 to form his own band. In 1934 this band was resident at the Kit Kat Club in London and made 87 sides for various labels between February 1934 and August 1936. In the mid 1930s he disbanded and formed an all-girl band called Teddy Joyce's Girl Friends. In the late 1930s he led a big band and was playing in Glasgow at the time of his untimely death in 1941. In Britain, Joyce was known as the "Stick of Dynamite" because of his boundless energy and enthusiasm. He made just two sides in the US in 1929 in a band that included the outstanding alto saxophonist Jimmy Dorsey. One of these two sides, included on this CD, features a violin solo from Joyce. Apart from the Romanelli Brothers, the other Toronto family that dominated the Toronto musical scene in the 1920s and 1930s was the Culleys. The careers of the four Culley brothers are intertwined with that of Fred Waring, leader of the widely admired Pennsylvanians. In the late 1920s, Fred Waring rivaled Paul Whiteman as a show attraction. His group was synonymous with raccoon coats, Stutz Bearcat roadsters, vo-do-de-o vocals, and the other supposed trappings of the "Jazz Age". By 1933 he was the highest paid bandleader in radio which influenced his decision to stop making records for many years. Waring was well liked by his band members, many of whom stayed with him for decades. Fred Culley joined as assistant conductor in 1925 and stayed with him until his death in 1966! Waring's band specialized in novelty numbers and the title included here, Hello Montreal!, is absolutely typical. Harry, the eldest Culley, was music director of Toronto's Royal Alexandra Theatre for many years. Ed Culley was a member of Gilbert Watson's Orchestra in the mid 1920s in Toronto. In 1927 he was a member of the Orange Blossoms orchestra, the American band that played at the Casa Loma Hotel in Toronto and later became known as the Casa Loma Orchestra. In 1934 he was a member of Fred Waring's band but was not allowed to join the band permanently because of union restrictions. He returned to Toronto to further his musical career. George Culley had played trumpet in Waring's band as early as 1921 and was a permanent member from about October 1926 until mid 1929. Fred Culley was music director of Shea's Hippodrome in the early 1920s and by the late 1920s was concert master of Waring's Pennsylvanians. He returned to Toronto in 1929 and his was the first Canadian band to play at the newly opened Royal York Hotel. Due to the onset of the depression, a plan to take his band into the US was thwarted in 1930 when the American government changed its immigration laws making it impossible for a Canadian group to cross the border. Fred disbanded and rejoined Waring's band, and Don Romanelli's orchestra took the job at the Royal York. The two sides by Fred Culley's orchestra on this CD show how good this outfit was. They would almost certainly have done well in the US had the opportunity not been stolen from them.